Researchers at the University of Miami (UM) Rosenstiel School of Marine and Atmospheric Science have developed a new technology to measure the currents near the ocean's surface that carry pollutants such as plastics and spilled oil. This new technique, which includes a specialized video camera to remotely sense currents in the upper few centimeters of the water column, can help scientists more accurately predict the fate of spilled oil or other marine pollutants that are transported at the surface layer by providing these measurements that were previously unattainable. "The health and economic impacts of spilled oil and marine debris have the potential to be profoundly negative," said UM Rosenstiel School postdoctoral researcher Nathan Laxague, and lead author of the study. "Improving our ability to measure near-surface ocean currents can aid in disaster response and provides for greater context in understanding the dynamics of marine pollutant transport." Laxague and colleagues conducted two experiments—one in a laboratory and one in the field at the mouth of the Columbia River—to test their new technique. In the laboratory study, the researchers imaged the water surface in the SUSTAIN (SUrge-STructure Atmosphere INteraction) facility using a specialized camera that simultaneously records three polarizations of reflected light off the ocean surface to determine the current profile for a range of wind speeds. In the field study, a research vessel was stationed in the mouth of the Columbia River along the Oregon-Washington border to verify the results from the lab experiment in a real-world setting. 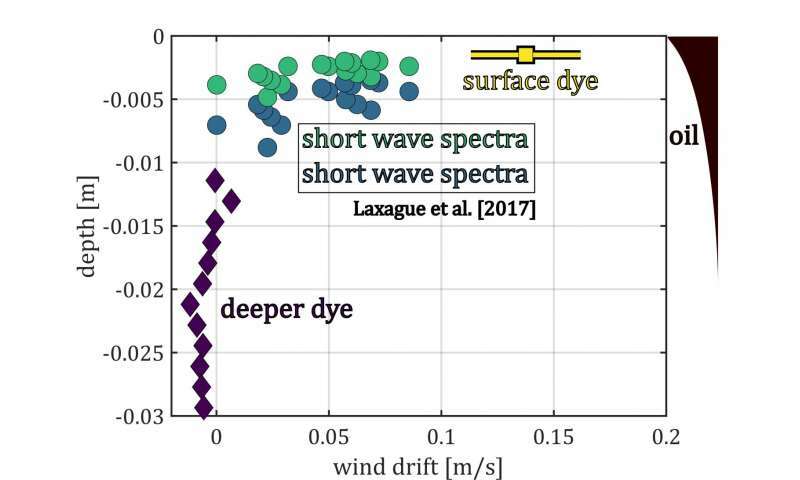 The data gathered from the experiments showed that the innovative optical technique is ideal to measure currents within the first few centimeters at the ocean's surface. "This slice of the water column is important because it is where oil, larvae and other drifting floating objects are, and yet, until now, scientists had no good way to measure it using existing technologies," said UM Rosenstiel School Ocean Science Professor Brian Haus, a co-author of the study. The study was conducted as a part of the CARTHE (Consortium for Advanced Research on Transport of Hydrocarbon in the Environment) and RIVET (RIVerine and Estuarine Transport) projects. Based at the UM Rosenstiel School, CARTHE, is a research team dedicated to predicting the fate of the oil released into our environment as a result of future oil spills. The paper, titled "Passive optical sensing of the near-surface, wind-driven current profile," appears in the Journal of Atmospheric and Oceanic Technology in its online pre-print version. The study's authors include: Laxague, Haus, David Ortiz-Suslow, Conor Smith, Guillaume Novelli, Hanjing Dai, Tamay Özgökmen, and Hans Graber from the UM Rosenstiel School Department of Ocean Sciences.